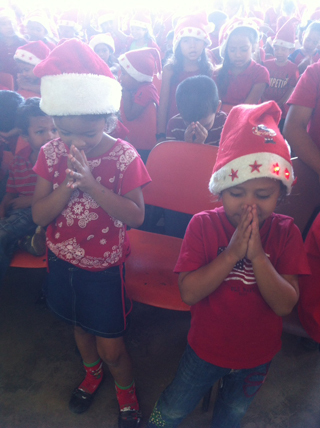 Nicaragua’s school year is February-November so around the U.S. Thanksgiving day our school year ends. The first week of December is set aside for grade reports, end-of-year activities, and school Christmas lunch and meal. Every grade/class has a small presentation, Christmas songs are sung, nativity-themed dramas, and celebration of the reason for Christmas. It’s a fun time and a great way to end the school and calendar year. Each student receives a special Christmas lunch with items normally not on the daily menu and a gift bag/back pack with a toy, hygiene items, clothes, and school supplies. This year we were especially blessed to give each child a new pair of shoes donated by Tom’s shoes. For most of our children it will be the only Christmas they will have and pretty sure the only Christmas presents they will receive. It’s always a joy to see the excitement on their faces when they open their presents.